Longer feature articles are in the works, but I thought I’d hammer out a quickie and leave the long one for the day off so you had more time to really take it all in at your own pace. I get asked a lot whether or not the ice blades are sharp, and recently I was asked why speed skates don’t tear up the ice in the same way that hockey skates do. I will attempt to cover both of these questions, and in short it really comes down to the way the blades work. Ice is naturally slippery stuff, but some things slide more easily than others. Of course, ice skating isn’t just about the sliding, it is also about turning. In fact, being able to ‘ice skate’ properly is all about balancing forces in the turns, and skating in a straight line is actually just a series of turns whose net effect is forward motion. I go into much more detail about the subtleties of skating technique in my technique lab, and my discussion of the differences between ice skating and inline skating, but basically you’re balancing the force of angular acceleration around an arc. This works because keeping a constant speed around a curve is actually a change in angular velocity. Changing direction normally requires energy, but when you’re balanced on a blade of metal on a sheet of ice, you’re basically building your own train tracks, and so this energy expenditure is minimised so long as you can balance the turning forces. You could do this with brute force and just push, but it’s more efficient to lean and push between your centre of mass and the point at which you contact the ground. So turning is important. How do ice skate blades do this? They deform. When you’re standing directly on top of your skates, the blades are deforming under your weight ever so slightly (and they’ll bounce back when you take your weight off). When you lean on an edge, the curved shape of blade means that the contact patch with the ice becomes a curved line. The difference in ice skate blades comes about because different disciplines demand different properties from the skates. Speed skaters are generally only concerned about going fast. As a secondary, but also important, concern, they want to go fast for as little effort as possible, so that they may either go faster using the same amount of energy, or further. A hockey skater, while is concerned with speed, is also concerned with manoeuvrability. They need to be able to turn quickly, to stop quickly, the change direction, skate backwards, and control their speed. It is not surprising that hockey skates and speed skates have developed to be very different. The most immediate difference you notice when you compare speed skates with hockey skates is that speed blades are very long, and very thin. A hockey skate is very short, and much thicker, and unsurprisingly each of these configurations is most effective at different things. Another major difference is that hockey skates (and figure skates) have a concave running surface, while the speed skate is flat on the bottom. Yes, the blades are sharp. In speed skating, the idea is to glide and push at a high speed. The radius of the corners is between 24m and 30m and the radius of the curve of the blades will generally reflect this. Speed skaters are also obsessive about sharpening and polishing their blades, with the norm being to sharpen every two or three sessions, although I know many skaters who sharpen their skates between every training session. When maximum speed is your primary goal, you want the most glide, and the most ‘pressure’ when you push. 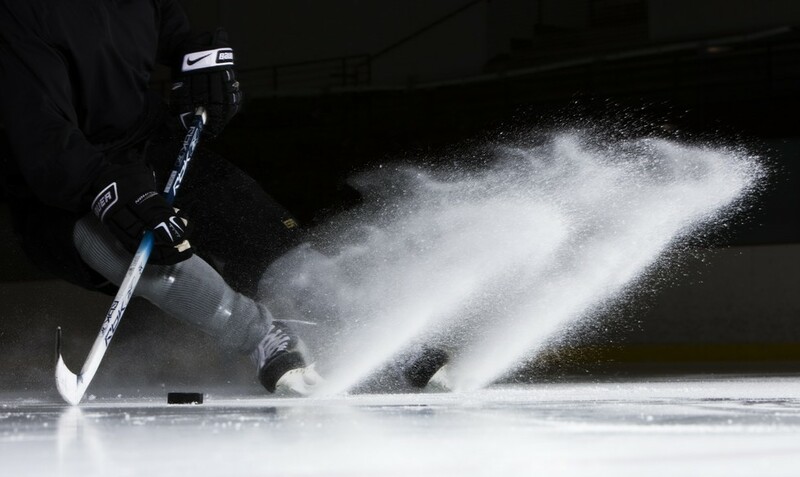 That means that when you lean over and put your skate on an edge, you want as much blade as possible to be in contact with the ice (it also spreads the skater’s pushing force and weight over a larger contact patch, which results in better glide). A flatter radius and thinner blade accomplishes this (thinner because it will deform more) and if you watch the speed skating very carefully, you will notice that speed skate blades only leave a mark right near the end of the push, when a skater is just picking up the skate from the ice; this is especially evident in the sprints. Actually, if you take a very close look at the ice after a speed skater has skated on it, there are very thin grooves in the ice, but they are so thin as to be nearly imperceptible to people skating over them. Although, if enough skaters skate over the same small patch of ice, these grooves often become more prominent. In short track, you really see this (and feel it) and the grooves in the corners can become quite deep and result in skaters crashing for no apparent reason (Charles Hamlin’s crash in his 500m heat comes to mind). So when we’re pushing, we’re only forming small shallow groves, and when we’re gliding, we’re gliding on a flat bit of metal and not getting much of an edge. Therefore the damage done to the ice is minimal. Hockey skaters on the other hand are constantly starting and stopping. The cover photo highlights quite nicely just how much ice is dug out of the surface when a hockey skater comes to a stop. This alone probably accounts for most of the difference that exists in the condition of the ice after a hockey practice when compared to a speed practice session. The blades, being thicker, also don’t deform so much – this actually helps with manoeuvrability because it ensures that the contact patch is always quite small. Further to this, because of the concave nature of the running surface, the skater is always on an edge. This is because sudden changes of direction are part and parcel of the game, but this means that even when a skater is ‘gliding’, those groves are still being put into this ice, as if the skater were taking a corner. And finally, the number of turns and stops that a hockey player makes in any given interval is time is huge next to that of a speed skater, who can predictably be relied upon to take about two corners every thirty seconds (and never have to change direction suddenly). Don’t forget to click the sochi2014 tag to read my other articles about the games. Especially the six(!) feature articles: anatomy of a race, speed suits, the differences between long track and short track, how it is NOT about the suits, and questions about the timing equipment (how fair is it to differentiate medals on a margin of 0.003 of a second?). This is all in addition to my daily recaps and previews of speed skating events. Any requests, questions, or suggestions for articles are most welcome. Did you take the picture of thrice hockey spray? on a wall and was wondering what your terms would be?